My hometown has a university, and the university has an art cinema program. It’s a nice place to go see indies, foreign films, and the occasional new 35mm print of a classic. Many college towns have something equivalent, and it’s all too easy to take for granted. This fall, the International Film Series (full disclosure: I’m their webmaster) is welcoming a new teacher to campus, showing many of his films on Wednesday nights, followed by a Q&A. The new teacher is Alex Cox, and two of those Wednesday films are Repo Man and Sid & Nancy. Those are punk classics, but I confess that I had not heard of Death and the Compass or Three Businessmen (had you?). So with two well-known exceptions, it would still be easy to take the series for granted. But it occurred to me — eventually — that this is a once-in-a-lifetime opportunity. A notable director with a long career in the movies is going to talk about his own work, for ten Wednesdays in a row, in my home town (for only $6 a pop, to boot). This is not something that happens every semester, and it may not happen again. Actually, something like it has happened before. Stan Brakhage would show his films at CU on Sunday nights and then lead a discussion. In his field (avant-garde film), Brakhage was bigger than Alex Cox. Way bigger. And although I lived in Boulder for many years, I probably didn’t go to a single Sunday Brakhage night. Now that Brakhage is gone and his work is carefully preserved and archived, I am embarrassed that I didn’t make the 10-minute trip to campus. I could have seen the man in person, with his personal copies of films that are now museum pieces, and I didn’t. Before my “aha” moment, I talked myself out of seeing the first Q&A with Alex Cox. I also missed Repo Man because I was out of town. 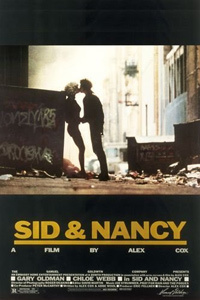 I nearly talked myself out of going to Sid & Nancy because there was a meeting of my homeowners association. Thankfully I felt a little guilty about making a lame excuse, and decided to go. I’ve seen Alex Cox twice now I don’t intend to miss any more. Cox reminds me of Wallace, Gromit’s mild-mannered master. He is cheerful, soft-spoken, English, gracious, and very polite. He even looks a little like Wallace, if you squint. Further, Cox is knowledgeable — obviously about his own movies, but also about films, film production, and more. Someone asked about... I’ll just say “an actor”... who took credit for his role in one of Cox’s films. In answer, Cox spoke briefly about the specific actor’s ego, then at length about the incredibly valuable quality actors bring to a film, and their frequent insecurity about their own value, so much so that, he speculates, they often try to become directors. With his liberal education and broad perspective, Cox would be the ideal dinner-party guest. He speaks intelligently on social movements, politics, art, film, music, and history. “How many people know J. Fred Muggs?”, he asks. Two hands in the audience go up. “Name me one good film directed by an actor,” he prompts. One sharp attendee says “Night of the Hunter,” earning a quick nod. Another says “Nil by Mouth,” and Cox attacks. Cox has definite opinions about films and can back them up confidently. When he offers them he seems not to be spouting opinion, but to be stating the obvious: of course They Live is a brilliant critique of the Reagan era, but only the first half of the film. And no, of course, Nil by Mouth isn’t a good film, although it does feature a good performance. After Walker (not as strong as some of Cox’s other films, in my opinion), Cox explained the connections he was trying to make, his mistakes in even attempting such an endeavor, and the successes that made the film as good as it was — all with what I now recognize as his “usual” candor, intelligence, and grace. As the semester continues, the titles become more obscure. The audience — packed for Repo Man, full for Sid & Nancy, middle-sized for Walker — may continue to shrink. If it does, I will understand why. Those HOA meetings can be very tempting. Luckily, I think there are a few of us who have realized that we have a rare opportunity here. I already recognize many of the same people in the audience. For example, I introduced myself to the “Night of the Hunter” man. It turns out he is taking a bus from Denver each Wednesday because he read, and liked, a book that Cox has written about his career. He figured coming to “Wednesdays with Alex” was cheaper than enrolling at CU for a semester. As for me, I’m just trying to make myself understand that it takes a little conscious effort to recognize these opportunities when they arise. Do I want to look back in ten years and try to remember the discussion of our HOA’s paving bids? Or would I rather be reminded, when I see that millionth rerun of the Simpsons parody of Sid & Nancy, that the director was as charming as Gromit’s pal and would prefer a more hopeless ending to the film?